I’m the type of mom who saves every last thing my children draw on or mark. I’ll admit that’s becoming a bit of an issue, because drawings and colored papers definitely pile up quickly. Because of this, I’ve began searching for kids’ artwork display ideas. I’ve been keeping everything in a file folder, but I really want to find a different solution. I want to display some artwork on our walls in the playroom, but also have a way to store everything so we can look back through the pieces when the kids are older. I’ve rounded up some awesome ideas and I can’t wait to implement a few of these in my home! P.S. There may be affiliate links throughout this post. If you purchase anything via these links I’ll receive a small compensation at no extra charge to you. This helps me keep my blog going, so thank you! You can read my disclosure policy here. This is such an adorable idea. 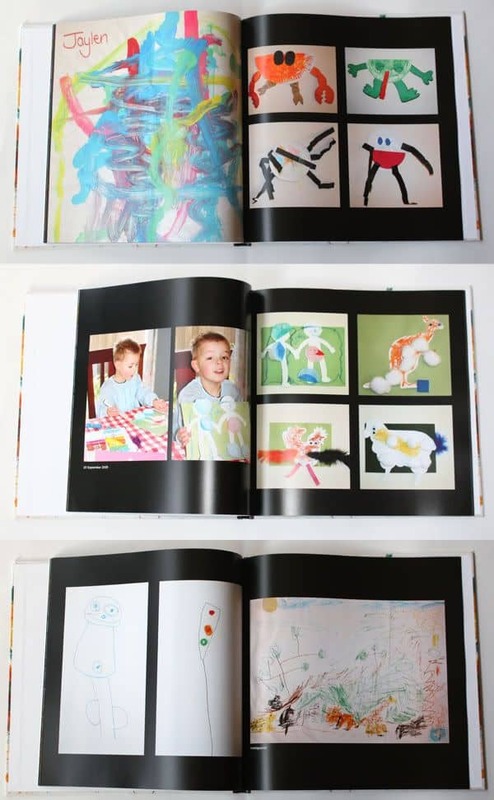 You can take pictures of your children’s artwork and turn it into one piece of art. You can check out the tutorial here. 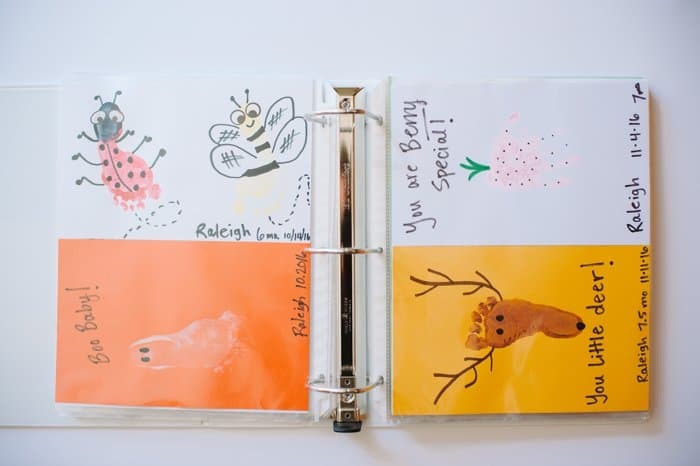 You can either use a binder or a photo book to store your children’s artwork and other keepsakes. 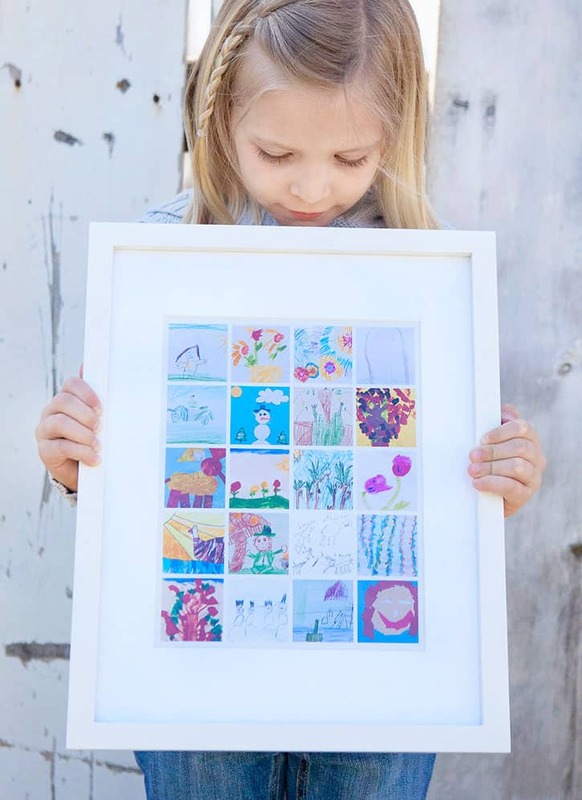 I am in LOVE with these artwork frames for displaying kids’ artwork! 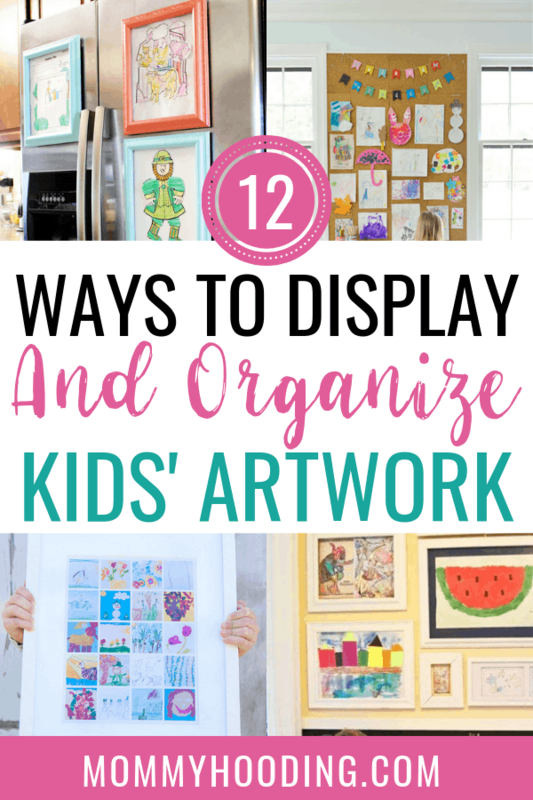 This is a great way to both display and store your kids’ artwork! You choose which piece of art you want to display in the frame, which can easily be swapped out. Behind that piece of artwork you can store up to 50 pieces of art. 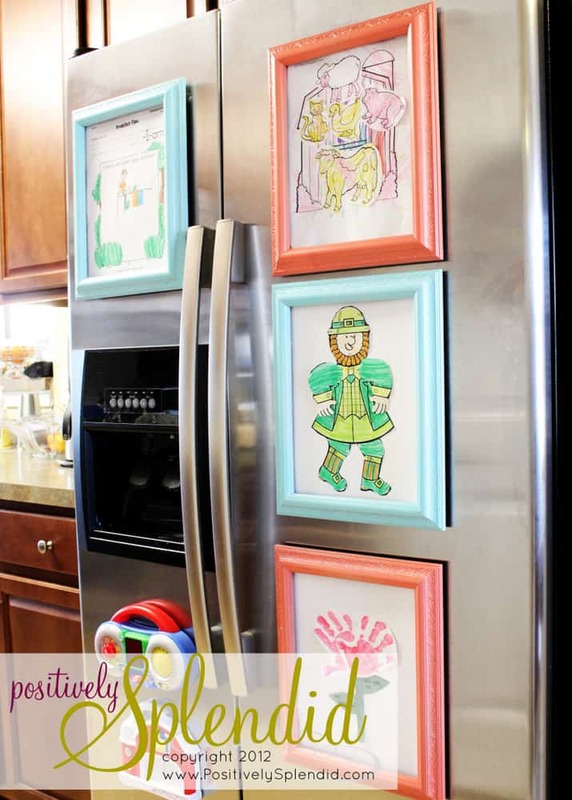 Another creative solution to displaying your kids’ artwork is with these gallery artwork frames. They’re super easy to swap out and they’re meant to store the typical 3-dimensional art pieces young kids tend to create. 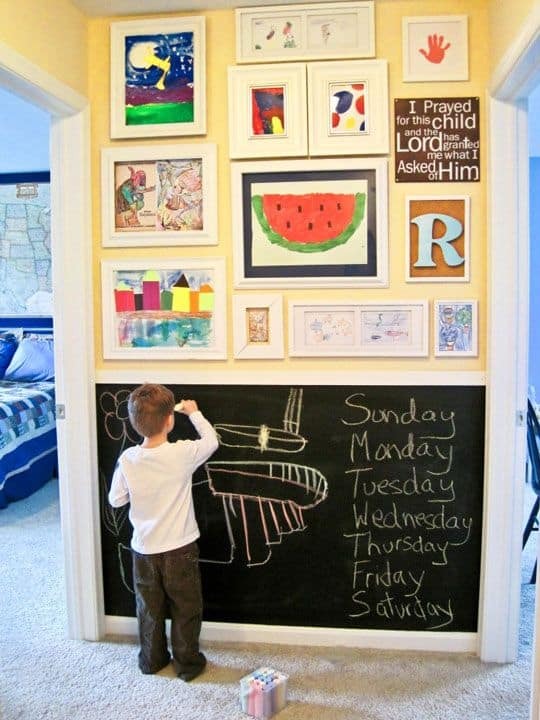 This is a creative kids’ artwork display idea. You can use close line with clips to show off featured artwork on the wall. I love this gallery wall space. They created on an empty wall at the end of a hall. This is such a great use of space and a special spot for the kids to have their creativity featured. 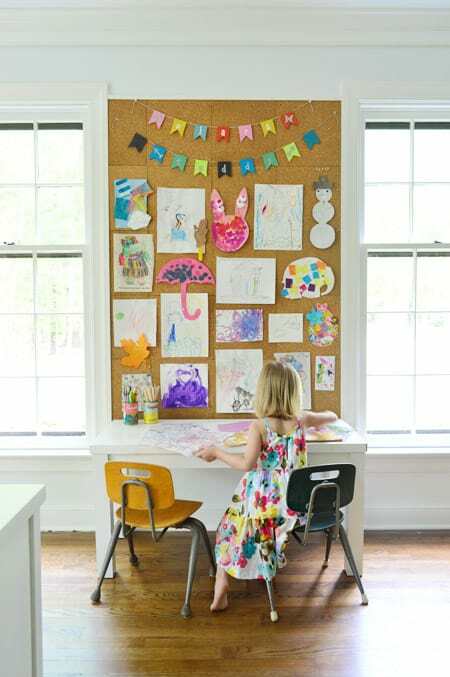 Another creative way to feature your child’s artwork is on a huge bulletin board. Such a cute DIY tutorial for this setup HERE. This is a whole kit you can find here. I love that this whimsical kit uses vertical space if you’re working with a smaller area. How cute is this idea? 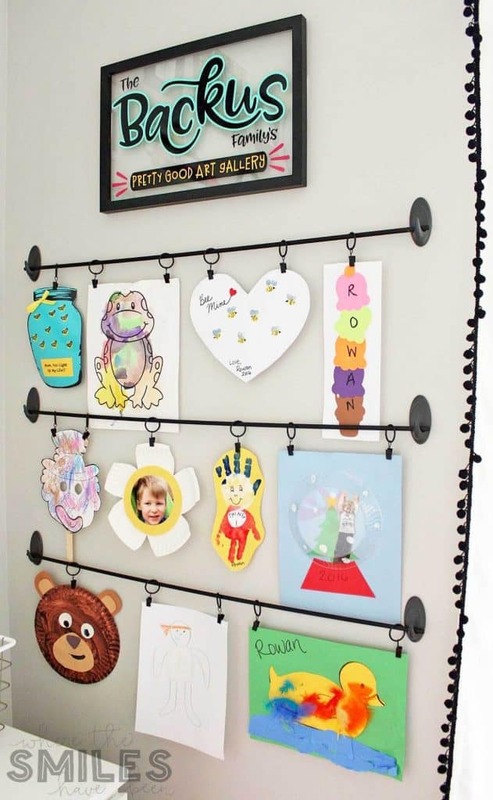 Magnetic art frames to showcase your kid’s artwork. Check out the tutorial over at Positively Splendid! Here is another kit that makes hanging artwork super simple, if you’re not the DIY type! Lastly you can use a service like Shutterfly and have all your children’s artwork put into a nice photo book. 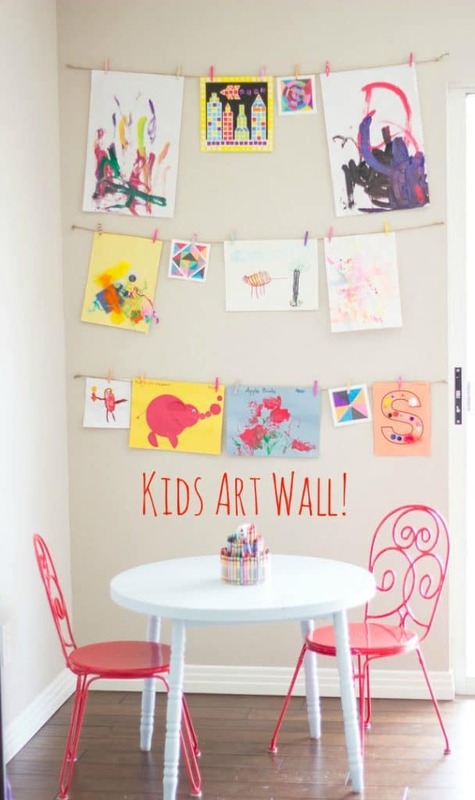 This is a great idea if you hoard ALL your kids’ artwork like I do.